In Scotland, ‘rewilding’ is the word now commonly used to describe the restoration of land to its natural state. Rewilding ensures natural processes and wild species play a much more prominent role in the land and seascapes, meaning that after initial support, nature is allowed to take more care of itself. Rewilding helps landscapes become wilder, whilst also providing opportunities for modern society to reconnect with such wilder places for the benefit of all life. Our nature reserve projects are aimed at doing exactly that. With the help of our supporters, we are transforming inaccessible commercial forestry plantations of non-native trees and barren landscapes into everlasting nature reserves which can be enjoyed not just by us, but by future generations. We have encouraged wildlife to return to the area, and our species lists at Glencoe Wood and Mountainview continue to grow every year. Perhaps the highlight has been the sighting of an Osprey at Glencoe Wood, swooping down and taking a trout from the lochan we created in 2015. 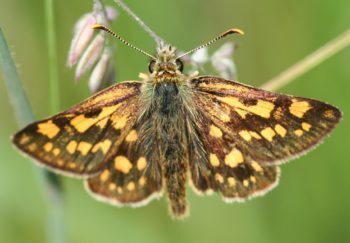 We have also witnessed the return of the Chequered Skipper, a species which died out in England in 1976 and is now confined to around 10 areas in Western Scotland. Where possible, we support other causes with similar aims, such as Wildcat Haven, The Bumblebee Conservation Trust and The Bat Conservation Trust. There is no use in reintroducing lost species if we let the existing ones die out. Rewilding is not without its obstacles. Livestock owners worry about the presence of their animals having natural predators, for example, but the movement enjoys strong public support and we find it encouraging that the first application for a licence to reintroduce the Eurasian Lynx to Kielder Forest was submitted in July 2017 by Dr Paul O’Donoghue, whom many of our followers have met at our annual Highland Gathering. The reintroduction of keystone species such as beavers and lynx enhance an ecosystem’s ability to regulate itself. Currently, deer numbers in Scotland are too high. They feed on tree saplings, damage young trees with their antlers and strip the bark from older trees. In order to prevent excessive damage to Scotland’s woodland (only 5% of the original Caledonian Forest remains), deer have to be shot as it has no natural predators. The Eurasian Lynx is a deer specialist and would provide a natural restriction on their number. The Scottish Beaver Trial successfully concluded in 2014, and on 24th November 2016, the Scottish Government announced that beavers would remain in Scotland. Their return marks the end of a 400 year absence and benefits of their reintroduction include the creation of new wetlands supporting a variety of other species such as otters, water voles, fish and dragonflies; the creation of more diverse woodlands through their tree-coppicing behaviour; helping to regulate flooding and improving water quality. There are several good sources of information on rewilding in Scotland, including The Scottish Beaver Trial , The European Nature Trust and the Lynx UK Trust.